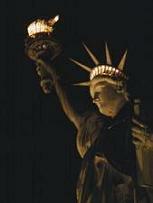 Liberty's Lamp: How's That "We're Not Retreating, We're Advancing in a Different Direction" Thing Working Out? How's That "We're Not Retreating, We're Advancing in a Different Direction" Thing Working Out? On November 4, 2008, Sarah Palin stood on a stage in Arizona with tears in her eyes after losing her bid to become the first female vice president in American history. On July 3, 2009, Sarah Palin explained to the people of Alaska that due to a grid-locking number of ethics complaints, she could no longer govern the state. 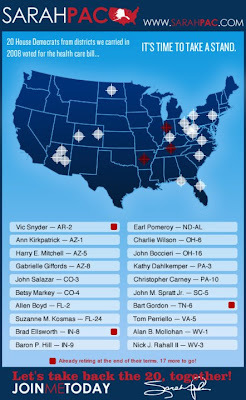 During the period between November 4 and July 3, Sarah Palin was a target - out in the open for everyone to hit. Yesterday, she stood on another stage in Arizona a millionaire and the de facto leader of the loyal opposition in America. Palin's resignation from her governorship doesn't sit well with the political textbook model types. But it does have an analogy to a military move that many have used in the past. Once a target is in the open, the opposition can hit it. The defensive strategy is to move out of the open, retreat possibly, and then come up behind the enemy and attack. Palin has done this. The liberals and the media are stunned at how someone could take the kinds of vicious hits that Palin has taken and actually come out stronger than she was before. In gaming language, she is that monster on level 12 that you just can't beat. We Palin supporters have been fighting the smears, taking on the mainstream media and finding ourselves sometimes in the crosshairs of liberal bloggers and certain MSNBC anchors whose name will remain anonymous (cough cough, Shannyn Moore, cough cough Keith Olbermann). Sarah Palin was on defense. Some of us saw Sarah as a victim. She is a victim no more. In fact, she is the one leading a head on charge. She has targeted 20 congressionial districts. Today, she's gunning (and in today's political climate I again must point out that this is meant rhetorically, not literally) for Harry Reid's head. Sarah Palin is on offense now. How does it feel, liberals, that that wild animal you were trying to kill is now running directly at you, showing it's teeth and there is nothing you can do about it? I'd use the imagery of a charging rhinoceros, but Palin is no RINO.